As a young girl in India, Tilo's parents were murdered by bandits, but she escapes and (literally) washes up on the shore of a hidden group of mistresses led by First Mother. First Mother teaches Tilo and the rest of the girls in the ancient art of spices. When she is ready, Tilo is dispensed to San Francisco where she runs Spice Bazaar. Her mission: to help clients achieve their desires; but never her own. She must never leave the store. And she must never touch the skin of another. Tilo has the ability to see the future. Using her clairvoyance, she dispenses spices and food as curatives...and to help others get what they need. All is well until a mysterious stranger appears and caused Tilo to question the ways that she was taught and lives by. This is a fun flick laden with rich, visual imagery of both food and spices, but also clothing and landscape. It has romance. And plenty of opportunity for a belly rumble. It definitely brings out my inner witch. It's not the deepest of films and I thought it was lacking a lot. I'm betting the book will answer my desire to delve deeper into the story. (It's on order.) Oh, and as another foodie aspect, Padma Lakshmi has a little part in the film...though it has nothing to do with food. 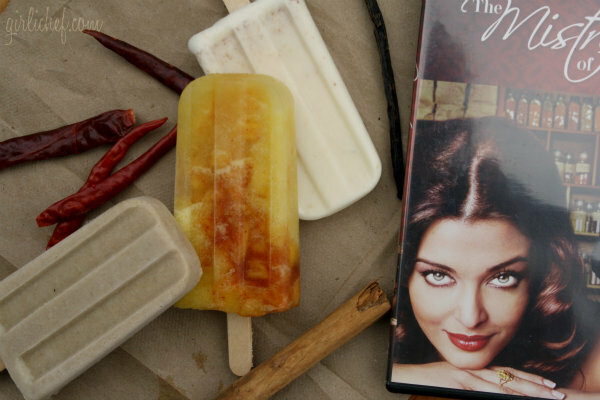 The Mistress of Spices is our Food 'n Flix pick for this month, chosen by our host Camilla of Culinary Adventures with Camilla. There's still a couple of days left for you to watch and post something inspired by this film, if you like. Since I am in hard-core popsicle mode lately, it probably comes as no surprise that I chose to make some that were inspired by this film. Afterall, it's hot in India. And in San Francisco. Go with it. And all three are laced with the mysterious properties of their spices...so choose wisely when sharing them. Vanilla for... its power to bring love, its lust-inducing properties, and its ability to restore lost energy and improve the mind. Preheat oven to 325° F. Spread coconut in a thin layer on a baking sheet. Place in preheated oven for 10-15 minutes, stirring it around every few minutes for even toasting. Alternately, you could place coconut in a nonstick pan and toast on top of the stove (my preferred method because it's quicker), but you need to watch it at all times. Toast and toss constantly until golden and toasty and beautiful smelling. Place coconut milk, sweetened condensed milk, half-and-half, salt, and vanilla in blender and blend until smooth. Stir in the toasted coconut. Divide among popsicle molds and freeze until hard, inserting popsicle sticks at the correct time for your molds. Chiles for... their ability to bring and reveal love and fidelity, and also for their hex-breaking properties. Cook water and sugar in a small saucepan over medium-high until mixture comes to a boil and sugar dissolves. Add the serrano and lower heat; simmer for 5 minutes. Let the mixture cool to room temperature and then strain. Finely dice 1½ cups of the pineapple. Mix with ground chile and salt; set aside. Coarsely chop the rest of the pineapple and place in a blender with the cooled syrup and lime juice. Blend until smooth. Divide mixture among your popsicle molds, leaving about ¼ - ⅓ of the mold empty. Freeze until slushy, ~30 minutes. Divide the pineapple-chile mixture among the molds, in the space that you left, pushing it down a bit with one of the popsicle sticks. Freeze pops, adding sticks when appropriate for your molds, until solid. How many ice pops you get really depends on the size of your pineapple. Try looking for one that is medium in size. Cinnamon for... increased spirituality, overall healing, increased psychic powers, protection, and its ability to manifest lover, gain knowledge, and be a friend-maker. Preheat oven to 400° F. Wrap unpeeled bananas individually in foil. Roast until soft, ~25-30 minutes. When cool enough to handle, scoop the flesh from the peels and place in a small bowl. Add both sugars and smoosh together with a fork until the sugars have dissolved. Place in the jar of a blender along with milk, cream, vanilla, lemon juice, cinnamon, salt, and rum (if using). Blend until smooth. Refrigerate until cold. Divide mixture amongst popsicle molds and freeze, inserting popsicle sticks at the correct time for the type of mold you have. I would love to start with the pineapple one! Oh, my gosh! I'm drooling! They look excellent, Heather and I'd love a sample of each right now. Thanks for the flick review, I will check it out. Que pinta los polos, me los apunto. Ooh! What a great post and what great inspired pops! 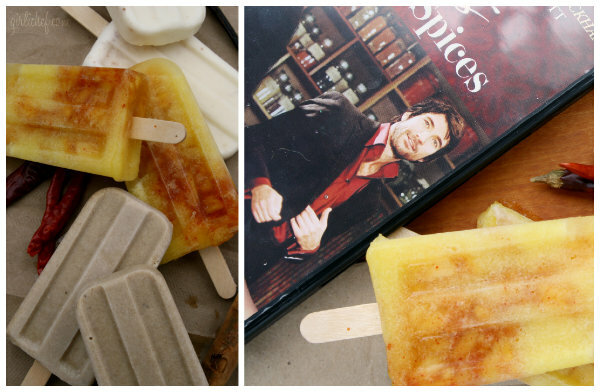 My post should be up on Friday, but it truly pales to this post and these popsicles three-ways! oh my gosh, that banana and cinnamon one sounds so rich and delicious! What a great trio of flavors! It is incredibly rich...decadent almost. ha ha ha...my thoughts exactly. How much cinnamon in the banana recipe? I see it's in the title and mentioned in the instructions, but not on the ingredient list. Thanks! You are on a pop kick, Heather! And what fabulous recipes too. I'm totally sold on the coconut ones....because there's condensed milk in them, of course. :) But would love to try them all. I could go for one of each right now! Especially the coconut! I never had roasted banana - this is the 2nd time seen in a recipe today so it must be a sign. This is such an amazing entry. I got a Zoku quick pop maker. In this hot summer heat, it wouldn't hurt at all to pour some of these mixtures into it! I just made the coco pops and they are in the freezer. I had a lot leftover b/c I only have one mold, but I have the rest in the fridge and will try it in the ice cream maker tonight. I think these are going to be delicious. Although I have a lot of popsicle molds, if I make a bunch of types or big batches, that's what I do! 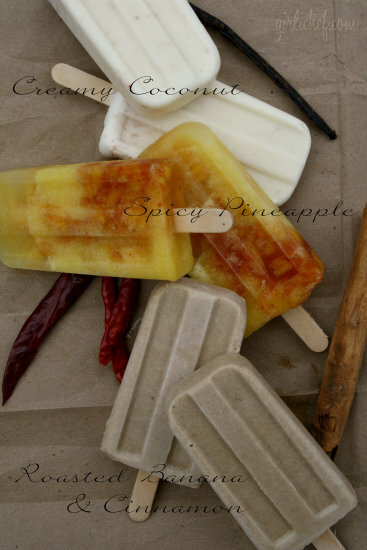 These tropical pops all sound so good - and I love how you have listed the properties of the spices you have used in them. There's always something lovely and mysterious about how spices work and their benefits. I think my favourite will be the creamy coconut pops but there is something in each recipe that makes me want to try them all! Wow, they all look amazing. I think the first and second would be my favorites. I love coconut and the spice addition sounds great. Thanks for sharing with Hearth and Soul! My coconut Popsicles wouldn't freeze! 12 hours and nothing is frozen. The other three flavors I made last night are good to go. Any ideas? ?? Not sure. Did you make them exactly as written? I've made them several times and they've always worked. The only thing I can think of is substitutions that didn't "act" the same. I've tried both regular (full fat) coconut milk and reduced fat, so I know both of those work. ?? I absolutely love this! Popsicles...I have to rethink that!! It's going to be over 100°F the rest of the week...Hmmmm. Oh my...what wonders you have unleashed! LOL! Your photo set up was outstanding as well!! Bravo! !